I would like to be a bit more specific than Mr Blanc. THE ‘danger gap’ is the difference between what brokers are PAID and what their clients’ perceive they are worth! That is, what value does a client place upon the quality of advice and service they receive from their broker? …surely TRANSPARENCY is only a threat if you have something to hide!? For Mr Blanc the “danger gap” was the space between what brokers earned and what clients perceive that they earned. via Blanc warns on commission disclosure Insurance Age. Biba did disappoint (rather than surprise) when Eric Galbraith, at their conference in May this year, vowed to resist EU regulatory calls for “hard disclosure”. I was not impressed and voiced my opinion at the time! For an industry involved in risk, we have become remarkably proficient at lecturing others on the subject whilst failing to take our own advice! Ignoring or avoiding inconvenient truths about our own shortcomings is standard practice. “Leaders” in the prevailing culture aren’t good at dealing with the truth…unless it’s their own particular brand. So it doesn’t come as much of surprise that the annual “Edelman Trust Barometer” tends to slip-by almost unnoticed! More inconvenient truths for the insurance and banking sector! If it weren’t for the fact that, ultimately, WE FUND the marketing they need to portray themselves, their products and services as something they are not, I would love the delicious irony of an industry that SPENDS such outrageous amounts trying to SELL to us instead of INVESTING to make their marketing promises more of a reality, restore damaged reputations, offer greater value and make their employees roles more fulfilling! Essentially this means that we pay a high premium, so an industry, [guilty of perpetrating “licensed fraud” such as PPI mis-selling] that we don’t trust, can continue to misrepresent itself and misinform us in an effort to obtain our hard-earned, tax paid, cash. Does this constitute a win/lose relationship, or what!!? They have become dependent upon our inertia and misguided belief that Politicians/Regulators will make things “better”. The lack of credible alternatives serves them well, as it maintains the income needed to sustain models that are crippled by the complexity they have created to, so efficiently, strip customer value for themselves. The full presentation makes for interesting/worrying/challenging (delete as appropriate) reading, as does the Executive Summary (click on infographic) and but before tackling that, here is a little “teaser”. So, what are the messages that the genuine leaders of tomorrow can take from research such as this? Of course there are other, less obvious, lessons to learn and it is one thing identifying the problems, another to tailor solutions to a particular business…but, if the process starts with recognition of the issues and a genuine desire to change, it is eminently “do-able”. In a volatile and uncertain economy effecting change may be the difference between survival and extinction. Innovators and “early adopters” will be the one’s to seize and retain competitive advantage. TRUST:: only if “leaders” can walk the talk! 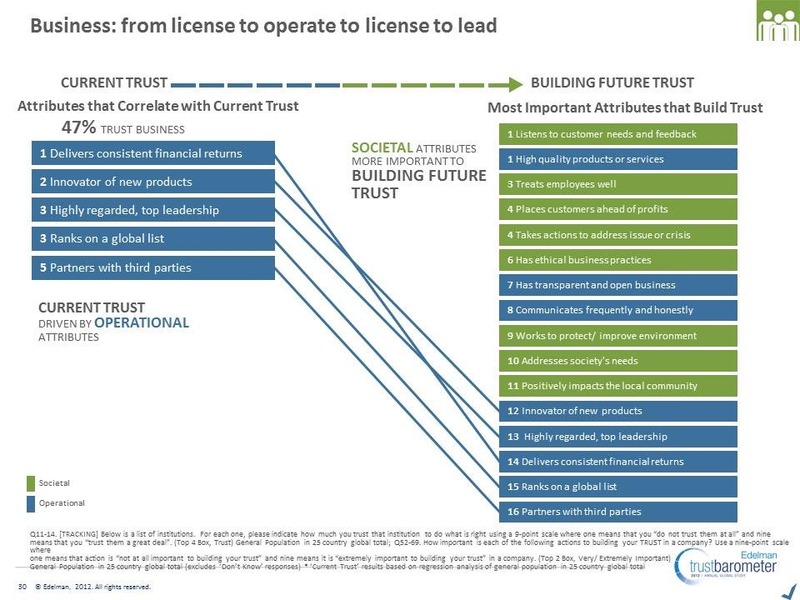 I can’t speak for anyone else but I have always reckoned that TRUST should be pretty high on the agenda for GOVERNMENTS and FINANCIAL SERVICES!? IF you still listen to “leaders” from either, they will tell you that IS the case. According to the old adage, “talk is cheap” and, from relatively early in our development, “easy”. Likewise, walking is another “basic” human skill. We see it happening every day in life and, those of us fortunate enough to have been blessed with the ability to do both, practise them on a daily basis…sometimes, even, simultaneously! SO, it would be reasonable enough to expect that individuals who have reached the upper echelons of their chosen careers would have no difficulty in doing both? But, there is growing evidence to suggest that this is not the case. The inability of a leader to “walk the talk” is a reliable indicator of a contaminated culture. Bloody Meerkats and an endless stream of unimaginative and downright infuriating caricatures sums up the “bounded creativity” of an industry whose idea of innovation has been dulled by years of squeezing every ounce of customer value out of products and processes to feed its insatiable appetite for revenue…and, hopefully, underwriting profit! In particular, the Personal Lines market is so deep in a rut of its own creation that, for all any of us know, this meerkat (I will concede they are cute!) may be a scout sent to see what the terrain beyond the rut looks like. Well here it is: how could anyone in their right mind trust an industry, whose best interests are served by attracting customers with a “good” risk profile, rewarding their profitability and loyalty BUT insists on spending outrageous amounts on scattergun marketing and incentivising disloyalty, then tries to claw back costs by compromising the integrity of cover and service. In a recent survey of 400 nationally represented insurance buyers, a clear message has been given that despite all the advertising and hype, there remains a serious lack of trust in insurance providers. Just under 73% believe that insurance providers make the terms and conditions in their policies deliberately complicated. Half believe claims are never paid out fairly. A third believe that insurance providers expect them to lie about a claim. Looking at the survey it cannot be disputed that price is a real determinant of converting an insurance sale, with 72% of the respondents attesting to this fact. However we need to look a bit more deeply. We questioned further about what factors are the most important when taking out or renewing a policy, their replies were clear and unambiguous. 89% stated that they look to their provider to be trustworthy and 79% said that it is important for insurance advisors to have professional qualifications related to insurance.